The parish of Sonnenbühl is known particularly for its subterranean beauty. The Nebelhöhle and the Bärenhöhle caves, and the Karlshöhle which connects with them, are limestone caves with some very lovely stalagmites and stalactites. They provide a clear illustration of the Swabian Alb's underlying structure – karst formed from limestone and make the UNESCO Geopark Swabian Alb a real experience. Come and get to know the Swabian Alb. Hardly any city is so connected with prehistoric times as Blaubeuren. Picturesque and full of Swabian hospitality, Blaubeuren offers its visitors unexpected insights into different epochs of history of the earth and of mankind - some still full of myths and secrets. Get ready to take a stroll along one of the most beautiful and famous castles in Europe. Experiencing a city with 1,200 years of history There are not many cities in Germany that give you so much visible history to experience. The city has been extended and built upon for way over a millennium. Esslingen’s ninety-three thousand inhabitants of today are proud to fill this historical ensemble with new life, over and again. A city for strolling in, a city to see and be seen: crooked alleys and historical edifices of stone bear witness to centuries of history just waiting to be discovered. You’ll find history around every corner in Esslingen. The Falkenstein Cave is an active water cave through which the River Elsach flows. The Große Lauter river rises from a karst spring in a natural bowl framed by the walls of the picturesque former monastery of Offenhausen. It meanders along a natural river bed for 40 kilometres through juniper heaths, caves and forests, past cliffs, picturesque villages and castles ruins to enter the Danube. The large number of castle ruins is an indication of their former significance: within a route of just 15 km there are ten. The Marbach, Mainhausen and Landgestüt with its stud farms in Marbach, Offenhausen and St. Johann is idyllically situated on the high plateau of the Swabian Alb, in the middle of the biosphere area. 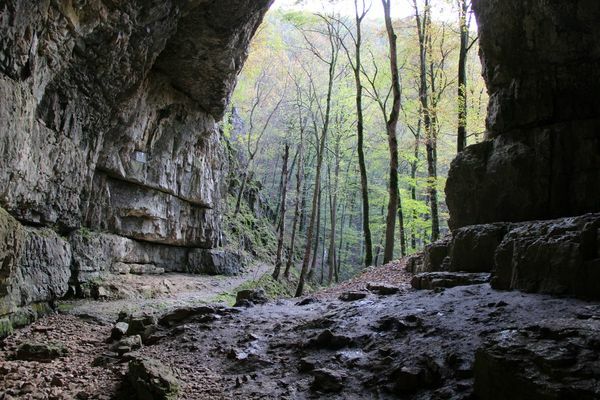 The Laichinger Tiefenhöhle cave is the only pit cave in Germany that has been developed to allow access to the public. Lichtenstein Castle is a historic 19th century castle, it lies on the Albtrauf of the Swabian Alb at an altitude of 817m above sea level. Here you can experience something! Reutlingen is located right in the middle of one of the most beautiful regions of the Swabian Mountains. Inventive, cultivated, relaxing and enticing at the same time. In the Stuttgart Region nature goes hand in hand with technology, and tradition with innovation. Tübingen with its old town will inspire you. Numerous half-timbered houses characterize this lively university town. Tallest church tower in the world, the historical quarter “Fischerviertel” and river Danube.